'Is it much different, having a girl?' I get asked this all the time and at the moment, it really isn't. Cora is a baby just as the boys were babies. She feeds, sleeps, poops and cuddles. She likes chewing things, standing up with support and then chewing more things - much the same as her brothers did. Changing her nappy is obviously very different but that is about it . . . well until it comes to dressing her. I have gone so much more girly than I imagined I would and I am loving being able to explore the other side of the shop. My lines on what is 'for boys' and 'for girls' is pretty blurry and Finn has plenty of clothes with 'girls' written in the label. Dresses were a step to far for me though, and whilst Cora is still non-mobile I am enjoying dressing her in them. I love stretchy, comfy and practical. Not too many frills or bows, not too much pink but still feminine, still 'girly'. 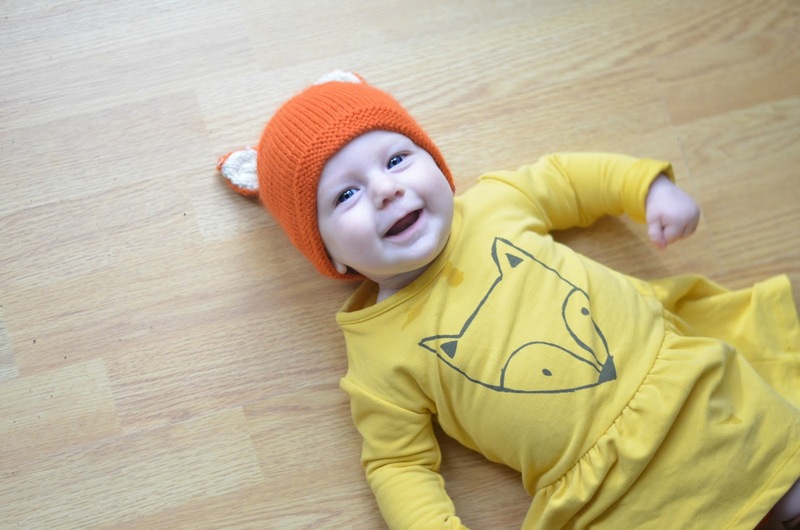 This fox dress from Iglo and Indi at Dapperbaby is just perfect. 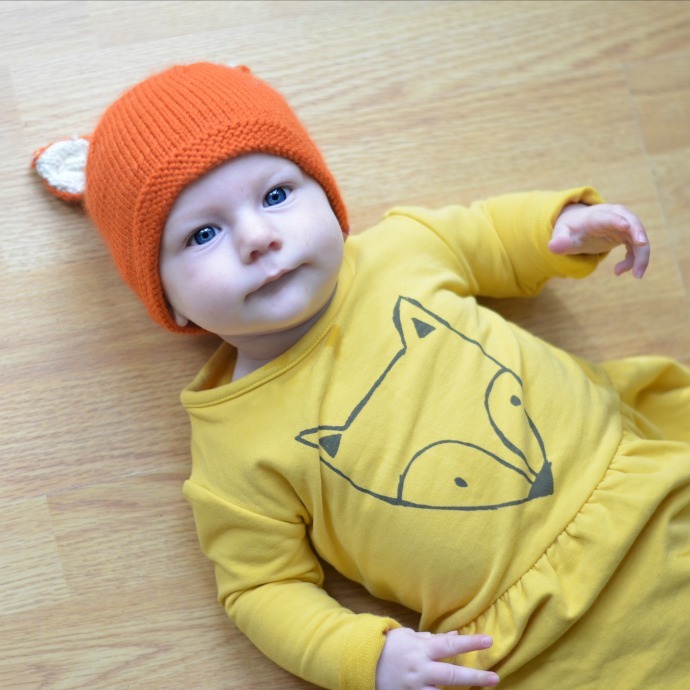 The cotton is so so soft, the colour is beautiful (in case you haven't noticed I love all things yellow) and the fox on the front makes it look fun. This dress is size 6-12 months and Cora is an average sized 5 month old. I love that she will get so much wear from this as it fits fine now but has plenty of growing space too. And because this is currently my favourite thing in her wardrobe and because she was in a super smiley mood when I tried to take a photo, I took a lot of photos . . . 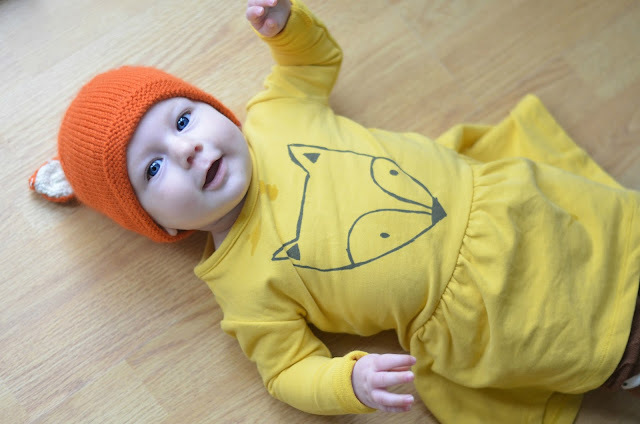 I paired the dress with some socks I picked up somewhere ages ago and I can't quite remember where (I think you can find them on ebay) and her Tootsa MacGinty fox hat - I love this outfit! We are popping tights on underneath the socks now that it is getting more chilly. I don't think it will be long until dresses become impractical and this little lady of mine wants to start moving, so I am making the most of being able to dress her however I like! 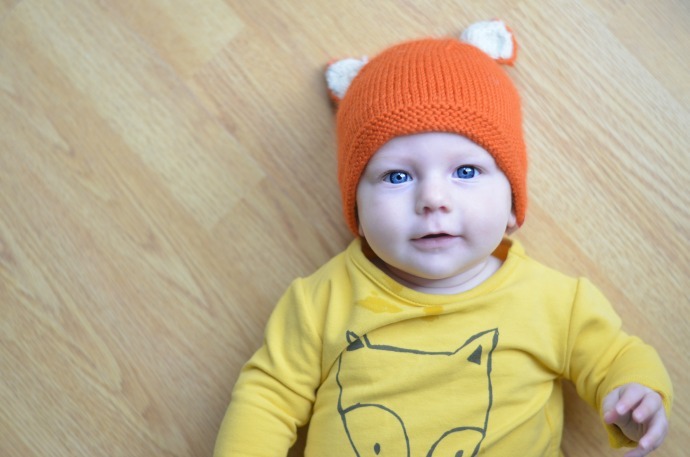 Thank you to the lovely Emma at Dapperbaby for this dress - we love it! She looks so cute! Love the leggings and hat. Hedgehog and Fox, so cool.